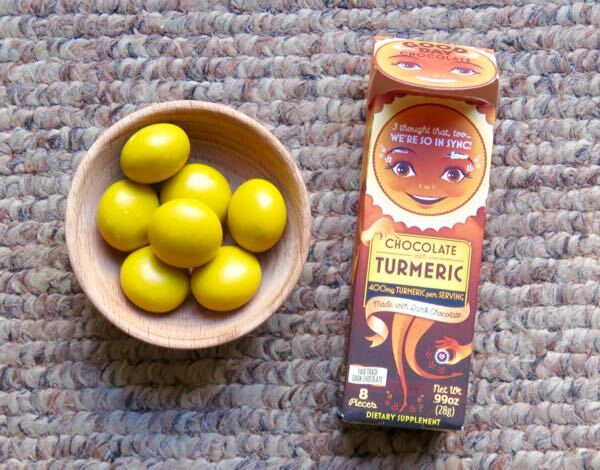 Welcome to Day #3 of Chocolate and Spices Theme Week, which includes chocolates blended with turmeric, ginger, licorice and other plant-based spice flavors. 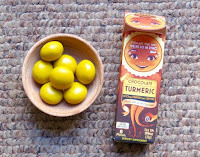 Today's Chocolate with Turmeric from Good Day Chocolate (Boulder, CO) was part of the company's "chocolate with benefits" line, that are also labeled as dietary supplements. In this case most of the benefits were provided by dark chocolate and turmeric. What's the big deal about turmeric? This golden spice (included in most curry powder blends) is related to ginger. An active substance called curcumin found in turmeric has been found to have beneficial anti-inflammatory properties. Today's chocolate packed a lot of goodness into one small, cleverly designed box. Made with fair trade chocolate, the package contained eight generously sized, naturally colored, roundish yellow pieces. 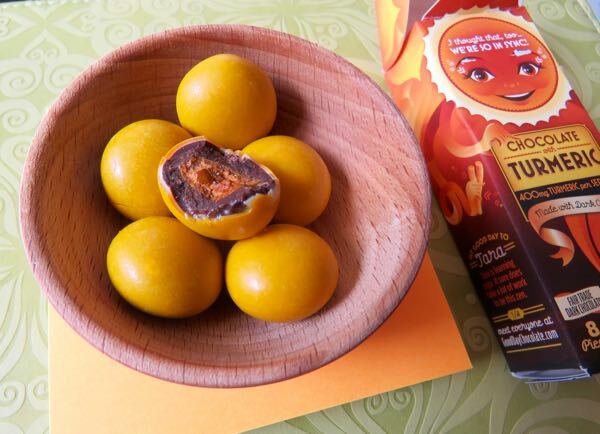 Each piece had a turmeric-colored center surrounded by chocolate and covered with a candy shell.